You doze during the 7 o’clock news—and find yourself wide awake at midnight. The nighttime “get-up-and-goes” are getting more frequent. Your legs “itch” when you’re trying to fall asleep. Your snoring wakes you up. Don’t wait another day to order this vital special report! We’ve all had a restless night. Or two. But when the restless nights outnumber the restful ones, it’s a sign of trouble. When counting sheep is the only thing you can count on, it’s time for help…help that is readily available, but too often goes unsought. Nearly two-thirds of all adults complain of sleep problems. Insomnia affects more than 70 million Americans. But only 4% of adults with sleep problems seek help. You can erase your sleep deficit! As adults, we no longer sleep like babies, or even teenagers. But sleep problems are not, and need not be, a normal part of getting older. The consequences of recurring sleep problems go far beyond nighttime frustrations. They can affect your health and your relationships, increase your susceptibility to illness, and contribute to premature aging. The good news is that the sleep problems encountered by most adults can be readily and successfully overcome with easily-implemented techniques, targeted medications, and simple lifestyle changes. Answers that take you from A to Zzzzs. The key to solving a sleep problem is identifying its cause. 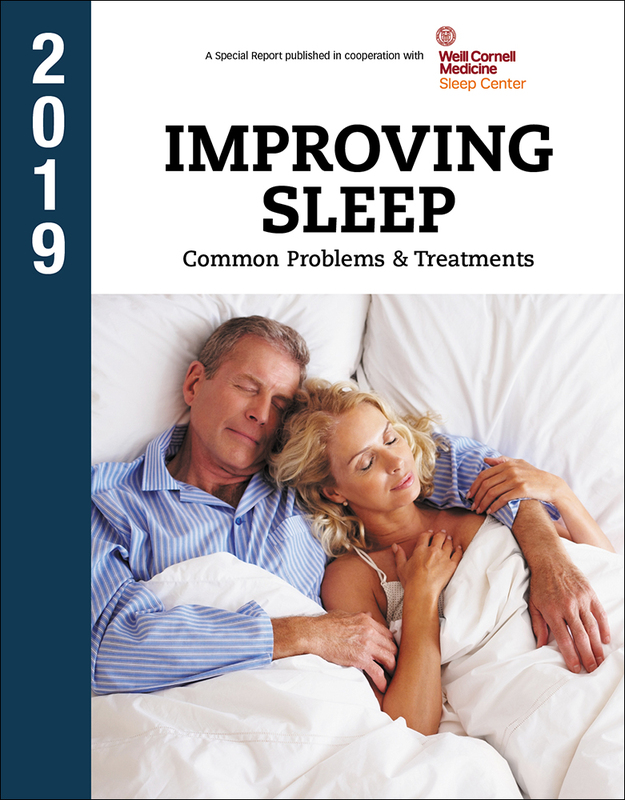 Improving Sleep: The 2019 Special Report is a practical guide for personal self-assessment to pinpoint the factors that are disturbing or preventing you from enjoying an uninterrupted good night’s sleep. Sleep disorders are caused by internal factors, including medical problems, or by external factors, such as stress. The Report will enable you to work with your physician to trace the cause of your specific problem and formulate an appropriate strategy to restore a normal sleep routine. Get the authoritative 2019 report Improving Sleep from Weill Cornell Medical College. Sleep problems can be readily and successfully overcome with easily-implemented techniques, targeted medications, and simple lifestyle changes. For example, have you been told that you snore? At least half of us have. It could be more than an annoyance to your spouse; it could be a threat to your health. Obstructive sleep apnea (OSA) can interrupt your breathing hundreds of times a night, elevating your blood pressure and increasing your risk of heart attack or stroke. Improving Sleep: The 2019 Special Report will show you how OSA can be diagnosed and which techniques offer the greatest hope for lasting relief. Halt the Sleep Stealers That Are Robbing You! Do you find yourself having to get up to go to the bathroom several times a night? You may have an overactive bladder (OAB). The Report will tell you about a simple exercise technique that can lessen the nightly urges, and a transdermal patch that can resolve OAB. Do you fall asleep sooner than you’d like—and awaken too early in the morning? The Report will share the proven techniques used by the Weill Cornell Medical College for Sleep Medicine to correct sleep phase problems and reset biological “clocks” without medication. You’ll learn what causes restless leg syndrome (RLS), the creepy-crawly sensations in legs or arms when falling asleep, and the one drug currently approved specifically for moderate-to severe RLS. The Report will tell you how to get the greatest benefit from a nap…an effective cure for sleep apnea…the 11 foods that can actually help you to sleep…the one herb that works as quickly as the leading prescription sleeping pill…the sleep medication adults over 60 should avoid…and why a firm mattress does not guarantee sound sleep. Improving Sleep: The 2019 Special Report is available now at the lowest price ever! A very small price for information that can impact your health in so many ways. After you receive the book, review and learn from it. If, within 30 days, you are not 100% satisfied with the information in the report, call, write or email us and we’ll gladly refund you your full payment. And to ensure that you stay on top of important findings as doctors and researchers continue to study sleep disorders and ways to guarantee a full-night’s sleep, we will reserve future annual editions for you on a priority basis and at our lowest price. We will notify you by postcard or email before the next edition is released and shipped to you. If you don’t wish to receive it, just return the card within 30 days. You will also be able to review each future issue before deciding to keep it.